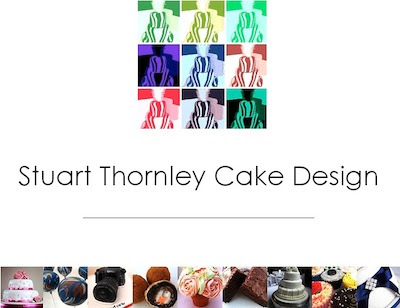 Stuart Thornley Cake Design is based in Dukinfield, Cheshire. We are award-winning creators of home made cakes, cupcakes, favours and other treats for special occasions such as weddings, civil partnerships, christenings, birthdays, anniversaries, corporate events - in fact, for any event you can think of, we can supply the perfect cake! Everything is home made from scratch, fresh for every single order, using tried and tested family recipes. Our company is listed as part of the Baked From Scratch campaign which highlights bakers who don’t use shortcuts or mass-produced ready mixes. We have an extensive range of unique and delicious cake flavours on offer, with new special flavours and designs appearing every month. Any design can be tailored to your specific preferences. Please see our website for just a hint of what we can offer you. Stuart Thornley Cake Design cakes and sweet treats can also be purchased from various stockists in the region as well as ordered direct from ourselves and, of course, from our Vintage Village stall the second Sunday of every month at Stockport Market Hall. We look forward to hearing from you with any queries and special requests you may have. Just get in touch! Visit Stuart's website, and catch up with his latest news on Twitter and Facebook. For more information why not send Stuart an email. All photographs by Photojenic Jen Hobday.